A crew of people wake up on a spaceship with no idea who they are in the Syfy series "Dark Matter." Left to right: Alex Mallari Jr. as Four, Roger Cross as Six, Anthony Lemke as Three, Melissa O'Neil as Two, Marc Bendavid as One, Jodelle Ferland as Five, Zoie Palmer as The Android. A spaceship crew of six people wake up to find they have no idea who they are or how they got there, in SyFy's new series "Dark Matter," which debuts tonight. The series is based on a comic book of the same name by "Stargate" alumni Joe Mallozzi and Paul Mullie, who also wrote and produced the new series. (Mallozzi also serves as showrunner.) During the pilot episode, more mysteries are established than are solved, and Mallozzi told Space.com that this trend continues throughout the series. You can watch the trailer for the series here on Space.com, as well as a clip from the pilot episode. The show takes place in a world where interstellar travel is possible and the universe is controlled largely by "multiplanetary" corporations. Historically, science fiction has been a genre ripe for exploring current social or political themes by placing them in futuristic settings, and the oppressive nature of the corporations in "Dark Matter" seems to be a reflection of the current discussion concerning the legal standing and power of multinational corporations. "I think it's important to reflect [society] in a sort of big-picture sensibility," Mallozzi said. "I personally find that, when you get into [addressing] specific, contemporary issues in an episode, it's interesting, but it tends to date your show. I like bigger issues — like, for instance, the notion of redemption, which comes up in the show. So, big-picture themes, I love to tackle; but specifics, not so much." The six crewmembers in "Dark Matter" struggle to find out who they are, and find that the answers may not be pleasant. Alex Mallari Jr. as Four. So, is the show more science, or more fiction? Mallozzi said it's a balance between the two in many cases. "I've always been the idea guy, and my writing partner is Mr. Logic," Mallozzi said. "When we were on 'Stargate,' we would try to write time-travel stories, and they would always take forever. They were almost impossible to do, because ultimately, if they did not make sense within the parameters of the rules you'd created, you know it wouldn't work. And it's the same thing, I think, with the science." Interstellar space stations serve as outposts for space travelers in "Dark Matter." For example, Mallozzi said, there's a moment in the show when the ship maneuvers downward and cuts to a shot of the crew rising up like an elevator. The team had to adjust the look of the ship to make sure the motion made sense with how the actors appeared to be falling. Syfy has produced 13 one-hour episodes of "Dark Matter," which will air on Friday nights at 10 p.m. ET and 9 p.m. CT. This is the first of three new science fiction shows Syfy is set to roll out this year. "Killjoys," about interplanetary bounty hunters, will debut next week, and will also air on Friday nights. "The Expanse," based on the popular book series, will debut later this year. 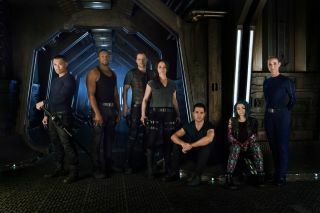 The "Dark Matter" main cast includes Melissa O’Neil (Broadway production of "Les Miserables"), Marc Bendavid ("Bitten"), Anthony Lemke ("White House Down"), Alex Mallari Jr. ("RoboCop") and Jodelle Ferland ("Twilight"), with Roger Cross ("The Strain") and Zoie Palmer ("Lost Girl").